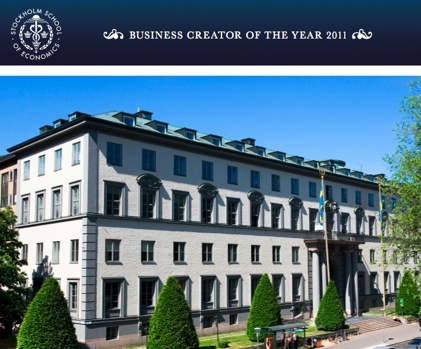 The Stockholm School of Economics – one of Europe’s leading business schools – has launched Business Creator Of The Year 2011, a challenge for young entrepreneurs with innovative ideas with the final award of being able to qualify for an admission place at one of the bachelor programs at the School. Applicants need to describe how they have developed an idea into a real, viable business; these applications are then assessed and shortlisted by the Stockholm School of Economics based on formal qualifications. The shortlist then enters an online voting phase by the public, and finally judged by a jury consisting of former students of the school, who are now prominent businessmen in leading companies. It’s really the first time an online nomination mechanic has been employed for being accepted into a leading business school, although some would argue that formal qualifications have no direct connection to innovation and entrepreneurship. You can find out more about the challenge at their campaign site. Please note that it is in Swedish.